Candidates. I originally developed this site as a record of my own exploration of large format and I have updated it several times as I learned more and could be more conclusive about earlier choices. As I have browsed various Web sites looking for information about entry level 4 x 5 equipment, here is a summary of what I have found. This will not be comprehensive, either in including all possible models that fall into this general category, nor for all sources for such equipment. The links I have provided are ones to sites where I found useful information; no other commercial endorsement is intended or implied. 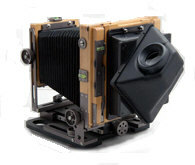 A good general source for information about large format equipment is the Large Format Photography site edited by Q.-Tuan Luong; virtually anything you find discussed here will be dealt with in greater depth and with greater expertise on that site. 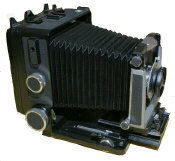 I have developed this site as a complement to two other LF sites-- the Large Format Photography site and the large format forum at photonet.org. As I have watched Web development I have noticed that forum formats have prospered in two ways; they present a low barrier of entry and are readily accessible to many and they are an incremental way of recording our knowledge about a subject. Accessing information in a structured way is not their strength. More conventional sites like this one benefit from having a single author in terms of organization, but they suffer from having a single author with a single point of view that is limited and may be biased. Increasingly, I am following a model of presenting basic information, then linking my categorical structures to forum posts that I think are particularly rich. Read everything you can about large format photography before investing, but eventually nothing will inform you like doing LF photography. Your own general buying habits will likely determine whether you want to try this with a minimum investment or whether moving upscale seems like a better longterm investment. A major goal of this site and of the book by Hicks and Schultz, Medium and Large Format Photography, is to provide some organized guidance for this first purchase. LF film sales and the sales of LF cameras designed for film seems to be stable or gently rising, indicating that users apparently believe that film in large formats gives them qualities that digital can't. Prices on the linked pages are current as of 04/2006. Finally, after you purchase a camera, look at the advice on the Large Format Photography site about how to use it. Associated equipment you might need. As you develop a lens kit, you may want to refer to David Karp's excellent summary. Check out the Community links on the LFP home page. The Directory provides a list of registered LF photographers. You can see samples of their work from the home page link in their listing. Use the LFP and photo.net forums as knowledgebases for LF information and ask for advice when searchs there don't provide the guidance you need. I've divided camera descriptions into four groups, but remind you that features vary considerably among large format cameras, sometimes regardless of the names that manufacturers use. The most recent version of the Descriptions include images of most of the cameras discussed. I have left the old gallery pages until I have more ideas about redesigning this feature. The camera profiles category below includes reviews I have done for specific cameras. Here is a comparison review of four of my favorite large format cameras -- Super Graphic, Meridian 45B, Gowland Pocket View and Wista VX. There are also detailed reviews of each camera from links on the Descriptions pages and from the Shootout page.